Ceram-Etch is the original porcelain etching gel for the dental lab. It is 9.5% hydrofluoric acid, porcelain etching gel used for the etching of "all porcelain" restorations. Ceram-Etch will etch feldspar ceramo metal materials, pressable ceramics including E.Max , milling blocs such a Cerecblocs, Vitablocs, Empress CAD and E.Max CAD. 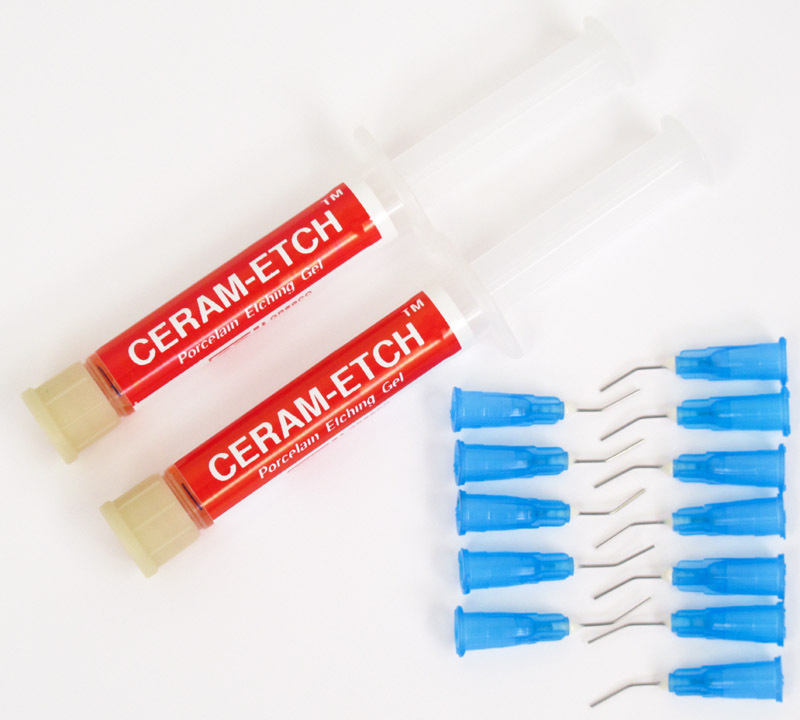 Ceram-Etch enhances bond strength by dissolving certain elements in the porcelain to create undercuts and voids in which the composite resin can flow. Etching with Ceram-Etch is the basis for the time-honored technique of etching, silanating, and bonding with composite resin that is used by some of the premier cosmetic dentists in the USA. No neutralizer is required, just rinse the restoration with water and place in an ultrasonic cleaner. Package includes 2 x 2cc syringes with 12 dispensing tips. Made in the USA. Empress and E.Max are trademarks of Ivoclar. Vitablocs is a trademark of Vita.